Cost: $40- $100 sliding scale based on your ability to pay. Location in SE Portland details given upon registering. Space is limited, so advanced registration is required. Learn how to stay securely centered in your body during magical workings! Want to consistently create a group environment that is emotionally resonant? Learn how to help others drop into their own depths. Improve your own ability to take in whatever learning you have come to get. Grounding generates inner spaciousness and the ability to remain neutral and energized in the face of anything. Anchoring is a basic energy practice, frequently used by people who are Priestessing and facilitating group magicks. This ritual technique focuses on grounding a group or room in order to keep unwanted energies out and foster an embodied, and nurturing environment. It encourages embodiment and helps to facilitate learning by improving people’s ability to be present. It is a preliminary practice for all group magick and psychic work in the Living Love Revolution community. This training is specifically for people who are anchoring groups doing magick, rituals, and ceremonies. This training is also for those of us who intentionally participate in the wonder and majesty of both birth and death doula and midwifery practices. This training is offered to anyone self identifying as a member of the larger communities participating in the Living Love Revolution. Anchoring is an important part of the Novice and Acolyte levels of LLR Aphrodite Priestess Training and is required for advancement in that system. People who wish to be on the organizing team of EcoSex are also required to practice anchoring. While the teaching is focused on people doing anchoring for rituals it will also be useful for people who hold space for others in settings that are intense and/or may bring up emotional distress, (hospice work, midwifery, doulas, classes focused on emotional healing etc). Looking forward to co-creating a vibrant community of skilled healers with you! This teaching has been developed by Kathy McKeever of Urban Cauldron and Oakry at the request of Teri Ciacchi of Living Love Revolution. The class teaches Energy Work techniques used within Living Love Revolution, Reclaiming. Oakry is a Priest, a Hospice worker and a spiritual leader wherever he goes. He is a member of the Radical Faery community and a person with deep resonance to “The old gods.” He has served in the role as anchor at the Living Love Revolution Aphrodite Temple which was essential to their success. Dr Liz March is a long time practitioner of energy medicine; acupuncture, qigong and bodywork. They are a lodge master of the local OTO body Sekhet Maat Lodge and is a long time magickal practitioner. They have served as the anchor for Aphrodite Temple for the last 3 events. There are planned breaks which will allow for snacking and rest. Please bring water to stay hydrated and your lunch. Bring light snacks low in sugar to help you stay grounded. Tea and water provided. Wear comfy clothes as breathing and energy work is our focus. Advanced Anchoring training will go beyond the basics taught in the Grounding Group activities course. Any one who has already taken the Anchor training from Kathy or Oakry is welcome to attend. Anchoring is an important part of the Novice and Acolyte levels of LLR Aphrodite Priestess Training and is required for advancement in that system. People who wish to be on the organizing team of Surrender:The EcoSex Convergence are also required to practice anchoring. 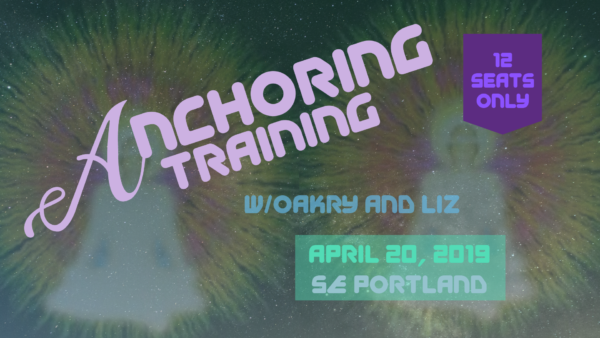 If you haven’t already taken an Anchoring Class from Kathy or Oakry but believe you have enough training in Grounding within an equivalent system of magic, please call Kathy at 206-245-4864. or Email: urbancauldron@yahoo.com to see if you qualify to attend the Advanced Anchoring class. Cost is sliding scale $40-$100 based on your ability to pay. Bring cash or check with you. Teacher dana is also appreciated, barter and trade options must be worked out in advance by calling Kathy and ensuring she is interested in the items or skills that you intend to trade. Space limited to 10 people. Kathy McKeever incorporates her personal history of over 30 years in magickal traditions, her experience as a Ritualist, a Tarot Reader and Priestess. You can contact her for readings with her self created Urban Cauldron Tarot deck at “Lemongrass Labyrinth House” in Bellingham, WA.